Here’s the line-up for our upcoming pop up. It’s number 13 in the series. 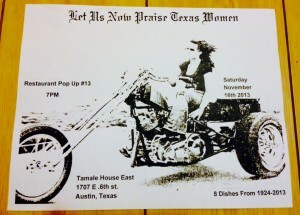 Let Us Now Praise Texas Women is the theme for this food party. Hope y’all can come out on Saturday November 16th at Tamale House East. As always, there will be plenty Chile con queso and Texas Hot Guts sausage as well. And we’re welcoming a brand new chef to the Scrumptious cooking team. She’s from Germany! This entry was posted in FOOD and tagged Austin, east austin, pop up restaurant, scrumptious chef, tamale house east, texas. Bookmark the permalink.